These handles have a large diameter near the top of the handle and taper at differing rates to the smallest diameter at the ferrule or pick. Some of these tools may have been identified as a scratch awl or scribe; however, they were probably used as an ice pick as well. L = 10-3/4", Long ferrule built into metal frame with two wooden side panels for handle. Inscribed on the pick - "LLMORE PAT SEPT, 21 09". Have not been able to identify the patent. L = 9-1/2", Long ferrule, pick has square cross section where it exits the ferrule. No special markings. L - 9-1/2", Two metal working surfaces, one on each side of the handle to crack and chip the ice to smaller pieces once chipped off the larger block. One of the surfaces has four pointed protrusion, while the other side has a raised but smooth surface. The ferrule is missing. This is a wine pouring spout with an on/off value. The tine of the pick is 0.09" diameter and is inserted into the pouring spout. The pouring spout assembly is secured to the pick by screwing into the lower portion of the ferrule. The pick acts as the point for screwing the spout into and through the cork stopper of the wine bottle. Then the pick is withdrawn and the spout is used to pour the wine and the value can be turned 90 degrees to block air from reaching the wine, keeping the wine fresh. L - 9-1/2", 3-1/3" Stroke, Brass ferrule, wood handle, sliding weight on handle shaft. Item listed on page 554 of Simmon Hardware Company 1883 catalog. Ice Tongs made of 0.08" steel wire attached to top of handle with single screw. Strong pick - 0.25" diameter. L = 11-1/2", Ferrule is part of pick. No special markings. L = 8-3/8", Ferrule built into pick, Eight flats around the handle. No special markings. STANLEY MADE IN USA on the ferrule. Ferrule l-1/4". Two (2) flats on opposite sides of handle. STANLEY MADE IN USE on the ferrule, 1.22" long ferrule, flats on two sides. Diameter of the pick is 0.31" and there are four flats making the point of the pick. No markings. L = 10-7/8", 1880 MK M KIRSCH marked on the handle. L = 9-3/4", Two scribed lines around the max diameter of the handle. No special markings. L - 8-3/8",Two scribed lines around the max diameter of the handle. No other markings. Comparison of the two picks. L = 8-3/4", No special markings. L - 9-1/4", No markings. L = 9-3/4", No special markings. L = 9-1/8", No special markings. This Item is not part of my collection. The pictures and information were provided by Bob Roger. The interesting thing about this ice pick is the arrangement of the ferrule with an unusual split nut inserted under the ferrule. This may be a means to replace the pick. See the above ice pick and information provided by Bob Roger. Since I was unable to remove the pick and fastening mechanism without damage, and the shaft is not marked like his tool, by tool may not have the same arrangement, but should be similar. The ferrule appears to be brass but isn't since it attracts a magnet and the wear on the ferrule edge at the wood handle reveals a silver colored material. No markings. L = 8-1/8", GILCHRIST marked on the ferrule. L = 8-5/8", Androck marked on the ferrule. About 70 percent of green paint missing. No markings. STANLEY, SW in a heart, MADE IN USA, HURWOOD marked on the ferrule. Ferrule is 1-1/4' long. Pick is 0.27" diameter. Missing the ferrule. No markings. L = 7-1/2", 0.25' pick, No special markings. L = 5-3/4", Thin tine - 0.1", No special markings. L = 6-1/8", No special markings. L - 8-1/4" (Green), 8-1/2" (Red), No marking and both appear to have original paint. 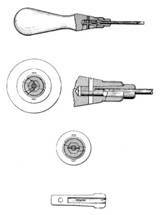 L = 8-5/8", Metal disc in center of ball handle to crack ice. No special markings. Diameter of the pick shaft is 0.08". There are no markings. I believe this tool is for testing the "doneness" of baked cakes, etc. However it may have been used to chip ice from time to time. L = 8-1/8", IVES ICE & COAL CO. NORTH TONAWANDA PHONE 186 marked on the handle. L = 8", The end of the handle has a slightly protruding metal area which was used to crack small pieces of ice. No special markings. L = 6-1/2", Long ferrule, Replaceable pick. No special markings. LUTZ FILE CO. CINCINNATI, OHIO on the ferrule. Thin pick diameter is 0.10". The tools below are probably punches and/or awls. However, they have probably been used as ice picks many times. The flats on some of the handles helps to keep them from rolling off the work surface. The two ice picks to the left appear to be hand made. The one on the left has a very ornate hand engraved handle. No other special markings. L = 6-1/2", Hand made, No ferrule and part of the pick has a triangular cross section. No special markings. STANLEY MADE IN USA on the ferrule. L = 6-1/8", STANLEY NO.117, MADE IN USA on the ferrule, flats on opposite side of handle.